Maranta leuconeura is an evergreen, low ground tropical plant famous for its distinctly beautiful and decorative 6-inch long leaves. The colorful marks on the leaves become more vivid as the plant matures. The plant has been noted to have small, white and non-fragrant flowers during the spring, but this usually does not occur indoors, rather only in rainforests where it originates. This should not be an issue, though, because the plant's striking appearance comes with its stunning oval-shaped leaves. The plant holds its leaves open downwards or straight during the day, and at night the leaves close vertically and resemble praying hands, thus the name Prayer Plant. This behavior is called nyctinasty, and it happens as a response to changes in the sunlight. The most common theory about this behavior in prayer plants is that the leaves take the closed shape during the night because it allows rain drops to fall through the leaves to the roots. It stops the rain from collecting on the leaves, which prevents bacterial growth and keeps the plant from freezing. It also helps it to retain moisture at night. Because of this interesting leaf phenomenon, you could easily spot this plant at graveyards, as it symbolizes the prayers for the deceased. Prayer Plant is not one of the species that can be neglected for weeks and still thrive. It is not too demanding, but it requires a lot of persistence and discipline. It needs specific conditions and special care to grow and reach its full capacity, so we don't recommend it for people who prefer low-maintenance plants. Maranta leuconeura is a low but spreading plant most often potted in hanging baskets. It can also be seen growing horizontally over flat surfaces. Its growth is fairly slow, so you don't have to worry about it growing more than you'd want. Furthermore, if you live in a suitably warm and humid climate, you can also grow this plant outside. The plant is not poisonous, and according to ASPCA, is non-toxic for dogs and cats. During the winter, expect it to take a rest in its growth, and lower the fertilization and watering. The plant will send out fresh, colorful leaves in the spring. Clean the leaves occasionally with a dry cloth to make sure they are dust-free. Prayer Plant belongs to the Marantacea family, mostly concentrated in South America. There are about 40 various species of the Prayer Plant, but the Maranta leuconeura is the most common one. There are a few varieties of the Maranta leuconeura, distinguishable by leaf patterns and coloration. They all require the same care. These are the most notable. The Erythroneura prayer plant has dark-green leaves with purple spots, and veins of a deep red color.. This plant tends to raise and fold up its leaves in the evening, then close in the morning. As the Prayer Plant originates from the rainforest, it can bear neither extremely hot nor very cold temperatures. These plants grow best in warm temperatures, between 65 and 70 °F. Avoid temperature below 55 °F because it could damage the leaves. If the temperature is too cold, the leaves will shrink and turn a brownish color, and if its too hot, they will turn dark as a result of burning. Prayer plants need to be watered generously, especially in spring and summer. The soil, however, should not be soggy. It requires slightly less water in fall and winter, so in these months, water it after the surface of the soil is a bit dry, but never let the soil completely dry out. These plants are sensitive to fluoride, so don't use hard water. Stagnant water could harm the roots, so be sure empty the pot saucers regularly. The water for these plants should be warm, or at least at room temperature. Yellow-pigmented, spotted, and curled leaves usually indicate under-watering, while limp stems are usually a sign of over-watering, which is most common in winter. Prayer plant requires medium to high light. When there isn't enough light, the leaves won't open entirely during the day, and if the light is too strong, it will fade the leaves and in some cases could kill the plant. So, make sure it is always under bright but indirect sunlight. You could also use a sheer curtain or something similar to protect it from the sun. Light shade is best for summer, and a bit brighter light is best in winter, yet it should still be indirect. If you have no other option, this plant could also grow under fluorescent light. You can use a usual house soil-based planting mix, which should retain the water but also drain fairly quickly. If you notice your soil isn't draining well, add some coarse sand to it. You could also add some gravel to the bottom of the pot to allow for better drainage. Make sure you use a pot with bottom holes so that the soil can drain freely. You can use wide, shallow pots because its roots don't need much room. But you can move it to a pot one size larger during the spring if you want it to grow more. Bear in mind, though, that too much soil takes more time to dry, so it could result in rotten roots. Keep the soil loose around the roots, and make sure it is well-aerated. Don't repot it too often, but to make sure it has enough air, re-pot it at least once every other year. This is best done in spring before the growing season. As you re-pot, remove the plant from its old container, shake the roots gently, and place into a new pot with fresh soil. You can divide the plant upon repotting if you want to expand your stock. You could also trim the roots for more vigorous growth. This plant doesn't need much fertilizer; twice per year could be enough. But if you want to boost its growth, feed it with light, half-diluted liquid fertilizer once every two weeks through the growing season. Reduce fertilization in the winter. 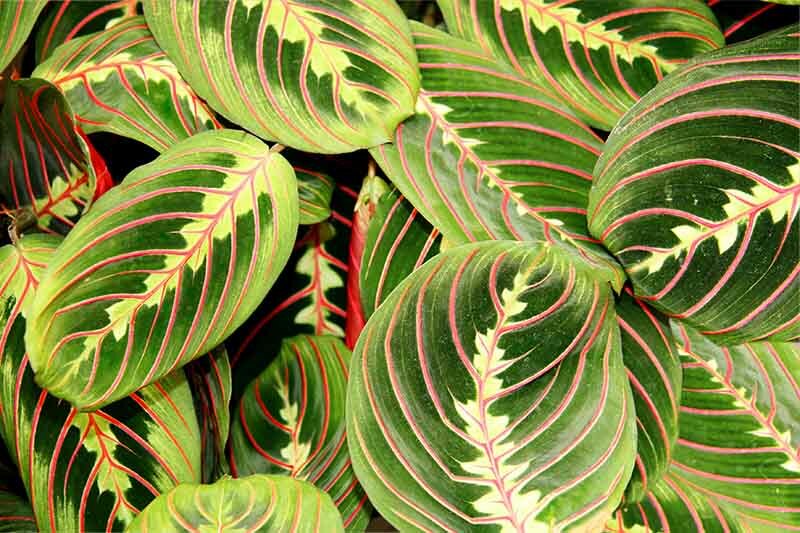 Prayer Plant is a tropical plant and thus requires a very humid environment. If the air is too dry, the leaf tips turn brown. Increase the humidity when the temperature is above 65°F, or in winter when the air is usually drier indoors. If you have a bright bathroom, it would be a great spot to place your Prayer Plant because the steam from the shower will add humidity to the air. Propagation of the Prayer Plant is fairly easy. You should do it in the spring. The cuttings should be 10 cm in length and have 3-4 leaves attached. Place the cuttings in a glass of water, or root them directly into fresh, moist soil. Add each cutting to a 2-3 inch pot. It's best to make a mix of sand and peat moss. Then, place it in a plastic bag and keep in a shady place. Rooting will usually happen in about a month, and then you should place it in a regular pot with standard soil, and treat it as an adult Prayer Plant. You can heat the bottom of the cutting to promote faster growth. Propagating by seed is also possible, but very rare. The best temperature for the seed germination is between 55 and 64°F. Trim the stems twice per year to improve the shape of the plant; it will keep it bushy and compact. Pruning will also help the plant to grow more quickly. The best time for pruning is in the fall. Use sharp, sterilized garden scissors and cut the stems above the leaf nodes. As you do this, the plant will grow a few new leaves just below the cutting area, resulting in a more bushy appearance. These plants are common targets of pests, including mites, mealybugs or aphids. Mealybugs are visible, soft insects covered with a white powdery-like substance, and usually curl the leavesAphids are light green pear-shaped insects. The best way to treat these two pests is by washing them away with water or insecticidal soap. Spider mites, however, are the most common pests to attack Prayer Plant, especially in dry winter months. The infestation will be noticeable by the tiny black spots and in the webbing around the stems and at the bottom of the leaves. It's better to prevent them than treat them, and if you keep the humidity high enough, you should not have a problem. Root rot can sometimes occur, and it means that the soil is not draining properly. There is also a possibility of leaf spot due to high humidity. You will notice this disease by watermarks on the leaves. Don't ignore this disease because it could be fatal for the plant in a matter of days. Reduce the watering and make especially sure that the leaves aren't too wet. You can treat this disease further with neem oil. 1. How to keep the humidity high enough? If you don't live in a naturally humid area, you should provide humidity through daily misting. You could also place a bowl of water near your plant. It will provide your plant with some extra humidity as it evaporates. Grouping more plants together could also help. Furthermore, you can make a DIY humidity tray or purchase a room humidifier instead if you want the least amount of work. 2. The soil for my Prayer Plant doesn't seem to work. What should I do? It's possible that your soil doesn't drain well, so add some rocks, gravel, or coarse sand to improve it. Make sure your pot has a drainage hole and that you are neither over nor under-watering the plant. 3. Why do the leaves of my plant curl during the daytime too? This is most commonly due to too much light, so make sure you place your plant under indirect sunlight. It could also be that you should place it in a smaller pot or raise the humidity in the room. 4. Why are the leaves of my Prayer Plant turning brown? There are various reasons the leaves could turn brown. Low humidity, excess fertilization or the fact that the leaves are touching a window could all affect the leaves of your plant this way. Brown leaf tips could also indicate that there is mineral build-up in the soil. You can prevent this by watering only with distilled water. 5. Should I cut the flowers off of my Prayer Plant? It depends on what you prefer. If you like the flowers, then keep them, but note that they reduce the growth of the leaves. So, if you want the leaves to grow to their full capacity, cut the flowers accordingly. 6. Why are the leaves of my Prayer Plant fading? This is most commonly due to too much light, so move your plant to a shadier spot. Also check for spider mites, since they sometimes cause fading of the leaves. Prayer plants can seem to be a high-maintenance choice at first because they need the perfect amount of water, light, and humidity to grow into healthy, longlasting plants. But when you set up the best conditions from the start and understand how to care for this plant, it will fairly easy to maintain it. When you put some time and effort into growing a Prayer plant, its striking appearance will make all your hard work pay off.